Wildly Popular since their mid 80's inception, the Ping Eye2 Irons are the original, and still one of the best cast, perimeter weighted cavity back irons on the market. These are irons I keep coming back to, they just seem to preform well. Mine have the ZZ-lite shafts and I really like how they work, stiff but not harsh feeling with the eye 2 heads. I have the 3-pw and the sand wedge which is the best sw I've played out of traps. The heads are bigger than blade type irons but not huge so you can still move them through the rough. I also appreciate their durability. Not sure if I have any negatives, people mention the weaker lofts, but thats easy to work around. Some times I'll go through a brief phase where I feel the off set has me miss aligning shots but that easy to correct. Bought my set in 1983 and used them ever since. In the last couple of weeks the 9 iron and the 7 iron lost their heads. Yep! Snapped right above the hosel. I asked Ping for a free repair and they refused on the basis that the clubs are too old. Nice corporate relations strategy Pung. Ping politely turned me down with no discussion. Will be switching brands for sure to Callaway and replacing my old Ping G2 driver with a Callaway X2 Hot. I've heard great things about their irons and drivers. Why i ever stopped playing these, I do not know. After several years of trying every other iron you can think of, i found a set of Eye 2's again and will not change. It is no wonder that every cavity back made since 1990 has copied these irons. they are easy to align, easy to hit, workable, and have a mid-size head. Other than sometimes wanting a little less offset, these irons are all that everyone else says they are and more. Perfect for any player - of any handicap. Find a set, buy them, play them, keep them. you name it - blades, game improvement, clones, etc. I've been using game improvement irons now for a while, mostly Burners - Plus and 1.0 models which were good clubs. However despite their oversized heads and thinker cavities and topline I just could get consistent results and even hitting a five iron proved tricky, i had no confidence. At the driving range i noticed the lie angle was very much impacting the toe and it wasnt recommended that i adjust them so I looked for a cheap set of pings on ebay and ended up with some Ping Eye 2+ for about £90 delivered, blue dot, matching serial numbers, ping confirmed manufactured in Jan 1990! Old Skool Cool. Had them custom fitted and adjusted at ping official fitter in Manchester, UK to Green dot, more upright to help reduce strikes off toe so impact is more neutral. First hits at driving range were disappointing, off centre hits gave a vibration through shaft, distance was reduced by a club length minimum due to their lofts being higher than more modern clubs, a 7 iron in Burner is even more steep than a 6 ping eye, so i was losing distance. Quite ugly too I thought. However, after a couple of rounds something happened which I cant overly explain but my distances just ballooned and my ball striking improved so now I get a very sweet feel from. 150 was normally a 6 iron but now I hit the 7 as normal or on a dry day where the ball is firing off the surface an 8. I even hot the 5 iron 190 yards the other day which amazed me. Now I pull the 4 iron out without fear but am yet to use the 3, preferring my hybrid. The wedges have been left in the cupboard as I have Cleveland CG15s with similar lofts which are amazing. 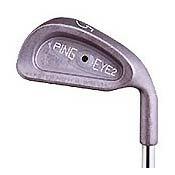 I found the ping eye 2+ wedges really large, angular and ugly but alot of people do rave about them so dont be put off. Overall I love these irons now, four full rounds later and I know they'll be in my bag for a while, plus I've gone from shooting high 90s to breaking 90 so hope the improvements continue. For the clubs and the custom fitting I paid £115 in total, a bargain for custom fitted classic irons. Well worth considering instead of blowing 300-400 on some off-the-shelf new irons. You get compliments on them too from those in the know at the course so quite retro-chic.